JET, the Joint European Torus, is the world's largest operational magnetically confined plasma physics experiment, located at Culham Centre for Fusion Energy in Oxfordshire, UK. Based on a tokamak design, the fusion research facility is a joint European project with a main purpose of opening the way to future nuclear fusion grid energy. JET was one of a number of tokamak reactors built in the early 1980s that tested new design concepts. It was one of only two designed to work with a real deuterium-tritium fuel mix, the other being the US-built TFTR. Both were built with the hope of reaching breakeven, the point where the energy created by the fusion reactions is greater than the energy being fed into it to keep it hot. JET began operation in 1983 and spent most of the next decade increasing its performance in a lengthy series of experiments and upgrades. In 1991 the first experiments including tritium were made, making JET the first reactor in the world to run on the production fuel of a 50-50 mix of tritium and deuterium. In 1997, using this fuel, JET set the current world record for fusion output at 16 MW from an input of 24 MW of heating and a total input of 700-800 MW of electrical power. This is also the world record for Q, at 0.67. A Q of 1 is scientific breakeven, a point JET was not ultimately able to reach. JET was built by an international consortium, which formed the nucleus for the European Union's contribution to the International Thermonuclear Experimental Reactor. JET has been described as a "little ITER" as the designs are very similar in many ways. In recent years, JET has been used to test a number of features from the ITER design. By the early 1960s, the fusion research community was in the "doldrums". Many initially promising experimental paths had all failed to produce useful results, and the latest experiments suggested performance was stalled out at the Bohm diffusion limit, far below what would be needed for a practical fusion generator. In 1968 the Soviets held the periodic meeting of fusion researchers in Novosibirsk, where they introduced data from their T-3 tokamak. This represented a dramatic leap in fusion performance, at least 10 times what the best machines in the world had produced to that point. The results were so good that some dismissed them as faulty measurements. To counter this, the Soviets invited a team from the UK to independently test their machine. Their 1969 report confirmed the Soviet results, resulting in a "veritable stampede" of tokamak construction around the world. A key issue in tokamak designs was that they did not generate enough of an electrical current in their plasma to provide enough heating to bring the fuel to fusion conditions. Some sort of external heating would be required. There was no shortage of ideas for this, and in the mid-1970s a series of machines were built around the world to explore these concepts. One of these, the Princeton Large Torus (PLT) demonstrated that neutral beam injection was a workable concept, using it to reach record temperatures well over the 50 million K that is the minimum needed for a practical reactor. With the PLTs success, the path to breakeven finally appeared possible after decades of effort. Breakeven is the point where the energy being given off by the fusion reactions is equal to the amount of energy used to run the reactor. Once breakeven is achieved, even small improvements from that point begin to rapidly increase the amount of net energy being released. Teams around the world began planning for a new generation of machines combining PLTs injectors with superconducting magnets and vacuum vessels that could hold deuterium-tritium fuel instead of the test fuels containing pure deuterium or hydrogen that had been used up to that point. In 1971, the Council of the European Community decided in favour of a robust fusion programme and provided the necessary legal framework for a European fusion device to be developed. In 1975, the first proposals for the JET machine were completed. Detailed design took three years. At the end of 1977, after a long debate, Culham was chosen as the host site for the new design. Funding was approved on 1 April 1978 as the "JET Joint Undertaking" legal entity. The reactor was built at a new site next to the Culham Centre for Fusion Energy, the UK's fusion research laboratory which opened in 1965. The construction of the buildings was undertaken by Tarmac Construction, starting in 1978 with the Torus Hall. The Hall was completed in January 1982 and construction of the JET machine itself began immediately after the completion of the Torus Hall. The cost was 198.8 Million European Units of Account (predecessor to the Euro) or 438 million in 2014 US dollars. JET achieved its first plasma on 25 June 1983. It was officially opened on 9 April 1984 by Queen Elizabeth II. On 9 November 1991, JET performed the world's first deuterium-tritium experiment. This beat the US's machine, TFTR, by a full two years. Although very successful, JET and its counterpart TFTR failed to reach breakeven. This was due to a variety of effects that had not been seen in previous machines operating at lower densities and pressures. Based on these results, and a number of advances in plasma shaping and diverter design, a new tokamak layout emerged, sometimes known as an "advanced tokamak". An advanced tokamak capable of reaching breakeven would have to be very large and very expensive, which led to the international effort ITER. In the early 1990s, it was decided to add such a diverter design to JET, which occurred between 1991 and 1993. 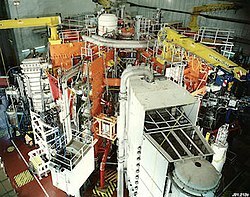 Performance was significantly improved, allowing JET to set many records in terms of confinement time, temperature and fusion triple product. It set the record for the closest approach to breakeven, reaching Q = 0.67 in 1997, producing 16 MW of fusion energy while consuming 24 MW to heat the fuel. This is also the record for greatest fusion power produced. In 1998 JET's engineers developed a remote handling system with which, for the first time, it was possible to exchange certain components using artificial hands only. A "Remote Handling" system is, in general, an essential tool for any subsequent fusion power plant and especially for the International Thermonuclear Experimental Reactor (ITER). This Remote Handling system was later to lead on to become RACE (Remote Applications in Challenging Environments). In 1999, the European Fusion Development Agreement (EFDA) was established with responsibility for the future collective use of JET. JET operated throughout 2003, with the year culminating in experiments using small amounts of tritium. In October 2009, a 15-month shutdown period was started to rebuild many parts of the JET to test concepts from the ITER design. This including replacing carbon components in the vacuum vessel with tungsten and beryllium ones. Heating power was also increased by 50%, bringing the neutral beam power available to the plasma up to 34MW, and diagnostic and control capabilities were improved. In total, over 86,000 components were changed in the torus during the shutdown. In mid-May 2011, the shutdown reached its end. The first experimental campaign after the installation of the “ITER-Like Wall” started on 2 September 2011. On 14 July 2014, the European Commission signed a contract worth €283m for another 5-year extension so more advanced higher energy research can be performed at JET. Under this plan, a new run of deuterium-tritium experiments, a “dress rehearsal” for ITER, would be carried out in 2019. Brexit has thrown the plans for JET in doubt. As part of their plan to leave the EU, the UK will also leave Euratom, which provides the funding for JET. Talks on the funding after 2018, when the current 5-year plan expires, were underway and a new agreement to extend JET's operation until 2019 or 2020 appeared to be largely complete. These talks were put on hold after the Brexit announcement, and are currently stalled pending the Brexit outcome. JET has a major radius of 3 meters, and the D-shaped vacuum chamber is 2.5 meters wide and 4.2 meters high. The total plasma volume within it is 100 cubic meters, about 100 times larger than the largest machine in production when the JET design began. JET was one of the first tokamaks to be designed to use a D-shaped vacuum chamber. This was initially considered as a way to improve the safety factor, but during the design, it was also noticed that this would make it much easier to build the system mechanically, as it reduced the net forces across the chamber that are trying to force the torus towards the center of the major axis. Ideally, the magnets surrounding the chamber should be more curved at the top and bottom and less on the inside and outsides in order to support these forces, which leads to something like an oval shape that the D closely approximated. The flatter shape on the inside edge was also easier to support due to the larger, flatter surface. While exploring the stability of various plasma shapes on a computer, the team noticed that non-circular plasmas did not exactly cancel out the vertical drift that the twisted fields have originally been introduced to solve. If the plasma was displaced up or down, it would continue travelling in that direction. However, the simulations demonstrated that the drift rate was slow enough that it could be counteracted using additional magnets and an electronic feedback system. The primary magnetic field in a tokamak is supplied by a series of magnets ringing the vacuum chamber. In JET, these are a series of 32 copper-wound magnets, each one weighing 12 tonnes. In total, they carry a current of 51 MA, and as they had to do so for periods of tens of seconds, they are water cooled. When operating, the coil is attempting to expand with a force of 6 MN, there is a net field towards the center of the major axis of 20 MN, and a further twisting force because the poloidal field inside the plasma is in different directions on the top and bottom. All of these forces are borne on the external structure. Surrounding the entire assembly is the 2,600 tonne eight-limbed transformer which is used to induce a current into the plasma. The primary purpose of this current is to generate a poloidal field that mixes with the one supplied by the toroidal magnets to produce the twisted field inside the plasma. The current also serves the secondary purpose of ionizing the fuel and providing some heating of the plasma before other systems take over. The main source of heating in JET is provided by two systems, neutral beam injection and ion cyclotron resonance heating. The former uses small particle accelerators to shoot fuel atoms into the plasma, where collisions cause the atoms to ionize and become trapped with the rest of the fuel. These collisions deposit the kinetic energy of the accelerators into the plasma. Ion cyclotron resonance heating is essentially the plasma equivalent of a microwave oven, using radio waves to pump energy into the ions directly by matching their cyclotron frequency. JET was designed so it would initially be built with a few megawatts of both sources, and then later be expanded to as much of 25 MW of neutral beams and 15 MW of cyclotron heating. JET's power requirements during the plasma pulse are around 500 MW with peak in excess of 1000 MW. Because power draw from the main grid is limited to 575 MW, two large flywheel generators were constructed to provide this necessary power. Each 775-ton flywheel can spin up to 225 rpm and store 3.75 GJ. Each flywheel uses 8.8 MW to spin up and can generate 400 MW (briefly). ^ Wesson 1999, p. 25. ^ "THE JET PROJECT: Design Proposal for the Joint European Torus". 1976. p. 25. ^ "The JET Project" (PDF). 1975. p. 17. ^ "How much power is needed to start the reactor and to keep it working?". EUROfusion. ^ "JET – A European joint venture". ITER. ^ Bromberg 1982, pp. 130-131. ^ Bromberg 1982, pp. 151. ^ Kenward 1979, p. 627. ^ Kenward 1979, p. 628. ^ Kenward 1979, p. 630. ^ a b c Stefanini, Sara (7 April 2017). "Brexit brings nuclear (con)fusion". ^ Rebut, Paul-Henri. "JET's first plasma". ^ a b c "About JET's startup". EUROfusion. Retrieved 9 December 2015. ^ "You searched for cost – EUROfusion". EUROfusion. Retrieved 9 December 2015. ^ "Measuring Worth - Results". Retrieved 9 December 2015. ^ "The Opening of JET 1984". EUROfusion. Retrieved 26 June 2016. ^ Rebut, P-H (1992). "The JET preliminary tritium experiment". Plasma Physics and Controlled Fusion. 34 (13): 1749–1758. doi:10.1088/0741-3335/34/13/002. ^ "Celebrating the 20th anniversary of the tritium shot heard around the world". PPPL. 9 December 2013. ^ The ITER project. EFDA, European Fusion Development Agreement (2006). ^ "Milestones around the world". ITER. ^ "JET". Culham Centre for Fusion Energy. ^ "JET". Culham Centre Fusion Energy. Retrieved 26 June 2016. ^ "How we do Remote Handling at JET?". EUROfusion. Retrieved 26 June 2016. ^ "What is EFDA" (PDF). Seccio D'Enginyeria Nuclear. Retrieved 26 June 2016. ^ "JET returns to operation with Tritium". EUROfusion. Retrieved 26 June 2016. ^ "The ITER-like Wall Project at JET". EUROfusion. Retrieved 26 June 2016. ^ "JET Shutdown Weekly: Week 81: Shutdown finished!". EUROfusion. 13 May 2011. Retrieved 11 December 2011. ^ "World's largest fusion experiment back in operation". EUROfusion. 2 September 2011. Retrieved 11 December 2011. ^ "Contract for Joint European Torus signed". Horizon 2000 projects. Retrieved 14 July 2014. ^ "Funded and used in partnership". EUROfusion. Retrieved 26 November 2017. ^ "EUROfusion and UK after Brexit". EUROfusion. Retrieved 26 June 2016. ^ a b Wesson 1999, p. 26. ^ Wesson 1999, p. 21. ^ Wesson 1999, p. 22. ^ Wesson 1999, p. 31. ^ Wesson 1999, p. 32. ^ Wesson 1999, pp. 32-33. ^ "775 tons of steel". EUROfusion. Retrieved 9 December 2015. ^ a b c "Power supply". EUROfusion. Retrieved 9 December 2015. ^ "Week 20: JET Experiments: sensitive to TV schedules". EUROfusion. Retrieved 26 June 2016. Bromberg, Joan Lisa (1982). Fusion: Science, Politics, and the Invention of a New Energy Source. MIT Press. ISBN 978-0-262-02180-7. Kenward, Michael (24 May 1979). "Fusion research - the temperature rises". New Scientist. Wesson, John (November 1999). The Science of JET (PDF). JET Joint Undertaking. p. 20.